Jacob Zuma’s hands tell us why he became the President of South Africa. He is far more than just a capable man - he is a master strategist and a pragmatist as well. Zuma has his weaknesses, but South Africa is lucky to have him at the helm. He is straightforward, with a strong belief in a cause, and a deep love for his country. Head Line. It is too high on the hand and slightly bow-shaped. This indicates (in combination with other signs) materialism and also a strong physical and sensual side to the personality. 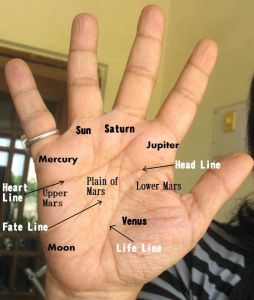 These tendencies are confirmed by the shape of the Mount of Venus and Heart Line, as well as the finger phalanges. The shape of his Heart Line, its connection with the Mount of Saturn and the developed Mount of Lower Moon and Venus confirm the sensualism which is a strong part of his nature. A person with these signs needs extraordinary will power to control his/her physical side. Check out his hand photograph here. Zuma's imagination and restlessness (Mount of Moon) take the edge away from his material side, to some extent. His pragmatism (shape of hand and fingers) prevents him from being addicted to money or stops him from going too far. He has a strong belief system (Jupiter finger) and this is another aspect of his personality which keeps excesses in check. It is clear from his Mercury and Saturn phalanges that although Zuma loves the good life, he does not love money. His beliefs takes precedence over everything else. It is difficult to say what exactly he believes in, but his beliefs are of a practical nature, not the religious kind. Honour and righteousness are words with meaning for Zuma. Jacob Zuma is an original and independent thinker and will not go with the herd. Various signs confirm this reading - the position of his Jupiter finger, separation of his Head and Life Lines, and the separation of his Mercury and Apollo fingers. The downside of this is that he is not an easy man to convince, further confirmed by the shape of his quadrangle. He has a difficulty in seeing another point of view. This attitude starts to soften as he enters his fifties. His dominating nature can be seen from the phalanges of his Jupiter (index) finger. Zuma is a thoughtful man, inclined to plan his moves and is an excellent thinker and strategist. He has an attractive personality, is outgoing and confident (high Venus, curved Heart Line, strong Apollo Finger and gap between Life and Head Lines), but he falls short of possessing real charisma. This is because his Mount of Venus is not wide enough, his Heart line not long enough, thumb not long enough. He does not possess the deep love, passion and force of personality that goes into making a person truly charismatic. Hand Readings of other African leaders: Nelson Mandela's hand reading or Muammar Gaddafi Hand Reading or Idi Amin's hand reveals his lack of reasoning powers or read about the Heads of State of different countries around the world. a lot international events are being held in RSA..his charisma has a part to play? what does it mean when the line of sun rises from saturn line? than you nita! Anonymous, the sun line can never rise from the saturn line. If a line rises from the saturn line and goes towards the sun it is a branch of the saturn line going towards the mount of sun and needs to be read in that sense. It is a positive sign on any hand and shows success if the line reaches the mount and runs on it and no other signs contradict this like bars, grilles, crosses or any other personality defect.